At SAP, our goal is to “help the world run better and improve people’s lives.” During the month of October, our employees strived to improve the lives of those in our local and global communities during SAP’s Month of Service. 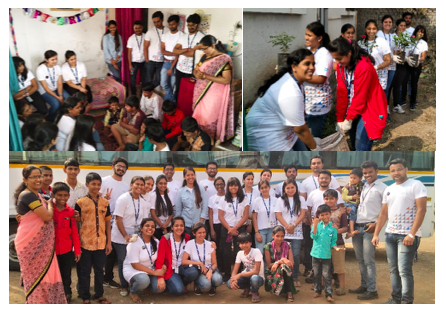 SAP iXp interns and team members all around the world joined in the volunteer efforts and gathered to give back to their communities. 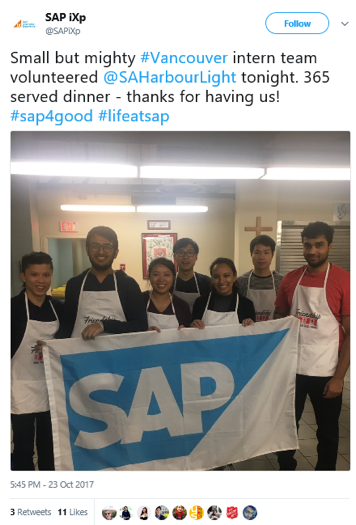 Check out our iXp interns in some of our global locations volunteering their time to join SAP’s efforts during Month of Service! 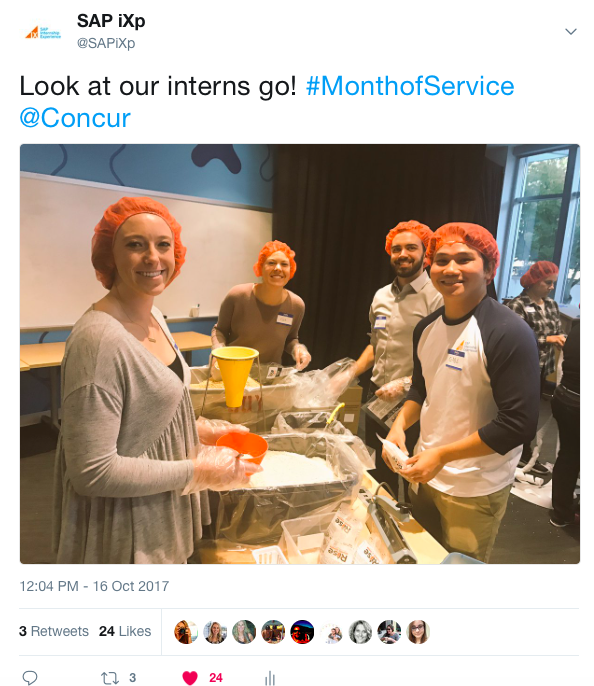 At the Concur Headquarters in Bellevue, Washington, iXp intern alumni Taylor Knebel, Ellie Mortenson, and Gabe Ho worked together with other Concur employees to pack over 40,000 meals for Rise Against Hunger. Each meal pack will feed around 6 people, and includes enriched rice, soy protein, dried vegetables and 23 essential vitamins and nutrients. The donated meals will be distributed to schools, orphanages, and clinics or vocational centers in troubled areas all around the world. Rise Against hunger’s goal is to end hunger by 2030, and iXp is grateful to help reach that goal. 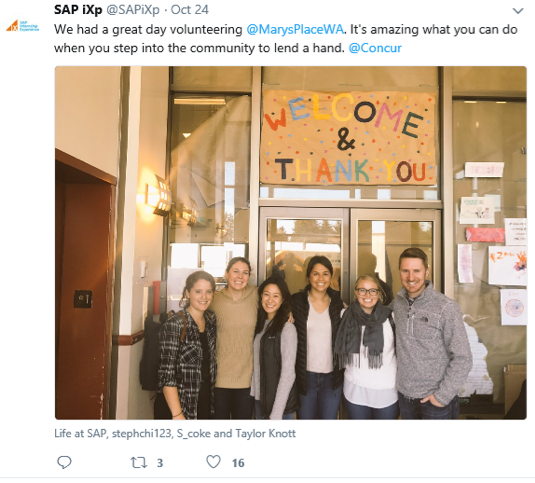 Part of the iXp University Team in Bellevue, Washington visited Mary’s Place, an organization that helps provide housing, resources, and a safe community for homeless women, children and families in the Seattle area. The iXp team helped residents apply for jobs and housing, tune their resumes, and sort through donations. 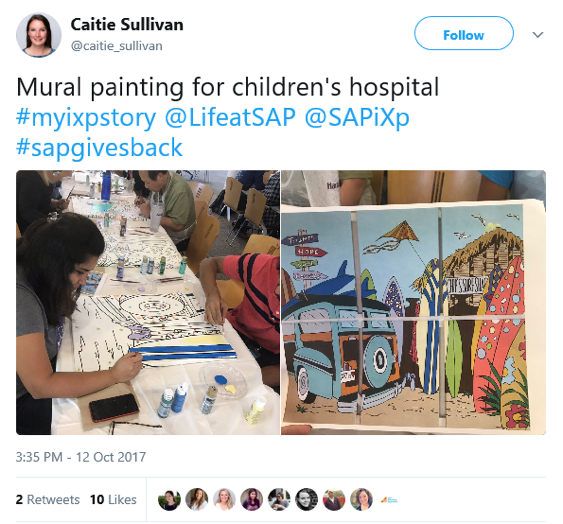 SAP iXp interns and team members in the SAP Palo Alto, California office and in the Concur office in Bellevue, Washington painted murals for the Foundation for Hospital Art. The Foundation’s mission is “To give comfort and hope to those who suffer in hospitals by providing artwork at no cost to hospitals.”. We joined other SAP colleagues to paint murals, that were then donated to hospitals all around the country. These bright and colorful murals help hospitals create a brighter and more positive place for healing. 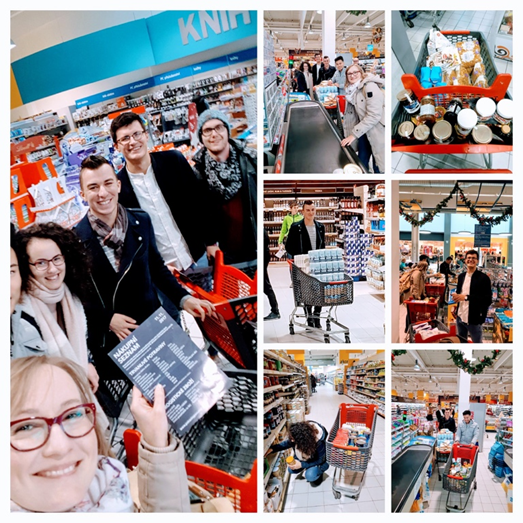 In Prague, our iXp Prague Lead Bara Vaclavikova and a few of our iXp interns collected money to purchase food for National Food Bank Collection Day on November 11th. In Vancouver, our iXp Vancouver Lead Jessica Gutierrez and fellow iXp interns volunteered at the Salvation Army Vancouver Harbour Light Centre. The organization helps provide resources and shelter to those in need. iXp helped serve dinner to around 365 of those in need in the Vancouver area. In Pune, India iXp interns and iXp Lead Swathi Sushilan volunteered at a Nirankar Balgram, a non-governmental organization (NGO) that focuses on the ministry of women and child development. Shout out to iXp intern Shubhra Joshi who took the lead on this volunteer effort, and found the NGO! Nirankar Balgram is run by a husband and wife who were brought up as orphans, and now they take care of around 11 kids and 8 elderly individuals. SAP iXp sponsored lunch for the group, and helped clean and plant a few saplings. They also provided groceries and blankets for the kids and the elder individuals in the home. 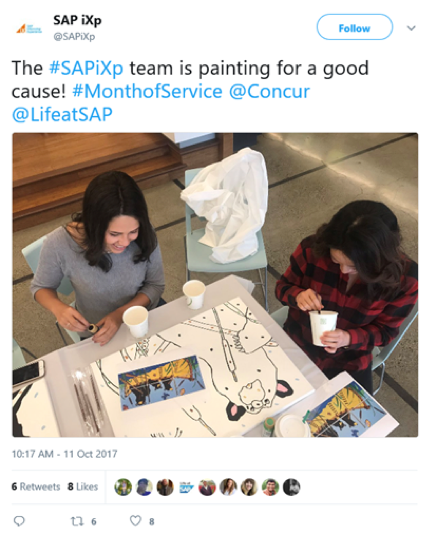 SAP iXp loves to give back, and we enjoyed joining the SAP volunteer initiatives hosted in October. We are excited to continue giving back throughout the coming year with more volunteer opportunities in each of our iXp locations! Check out more of SAP’s #MonthOfService here!